This is Mike Janich’s Martial Blade Camp in 2013. 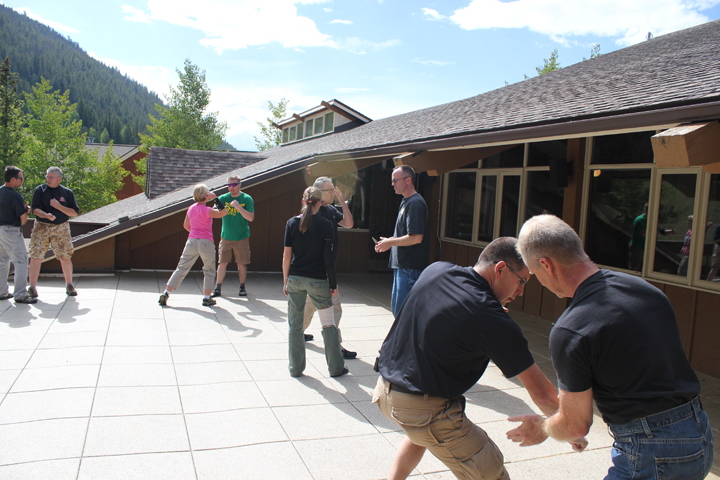 This year join me (Mike S.) and Mike in Colorado for some incredible immersion training! Sign up NOW before it fills, and tell him you heard about it on the S-P Blog. power and dispelled some of the myths associated with the defensive use of the knife. Your feedback on that article was very positive (thank you!) so I’d like to follow up with a more detailed discussion of my approach to knife targeting. After all, it’s one thing to question or even disprove a commonly held belief; but it’s much more beneficial to actually provide a better, more logical solution. That’s the goal of this article and the core of my system of Martial Blade Concepts (MBC). The roots of MBC are in the Filipino martial arts—a family of fighting arts that is unique in its practicality. Because of their challenging, sometimes tragic history, the Filipinos learned to fight against their aggressors using whatever resources they had at hand. Their tactics were based on angles and the natural mechanics of the human body’s motion. Using these mechanics as a foundation, they learned to express their tactics by adjusting their targeting to match the attributes of the weapon they happened to be wielding. If a fighter had a stick—a weapon best suited for breaking hard targets—he would use the core mechanics and angles to strike bony parts of his opponent’s body with the goal of breaking bones to disable the threat. If he had an edged weapon best suited to cutting soft tissue, he would use the same mechanics and angles to cut key muscles, connective tissues, and blood vessels with the same goal—disabling his opponent. If he had a sword or similar large, heavy edged weapon, he had the best of both worlds. One of the first steps in “defanging the snake” is taking away the attackers ability to hold and use a weapon against you. In my opinion, the most brilliant tactic in the Filipino arts is based on a concept called “defanging the snake.” When an attacker armed with a weapon swings or thrusts at you, rather than blocking, parrying, or evading and then countering with a similar attack, you simply target his attacking limb. Done properly, it causes him to drop his weapon instantly—literally taking the “fang” (the weapon) from the “snake” (the arm wielding it). From an OODA-loop decision-making standpoint, this approach is dead simple. He sticks his arm out to attack and you attack it. Even though you are reacting to his action and therefore inherently slower, you can actually use the force of his strike to increase the force of yours by hitting or cutting into its motion with a mirror-image movement. If he throws a high forehand strike, you match it with a short, economical high forehand of your own, “letting” him hit himself or cut himself on your weapon. As a knife tactic, defanging the snake is extremely effective because it directly targets the structures that allow his hand to hold a weapon. In simple terms, muscles pull on tendons to move bones. To grip a weapon, the muscles of the forearm contract and pull on the flexor tendons, which pass through the inside of the wrist and attach to the fingers. By severing the tendons or the muscles that power them, this connection is broken and the hand can no longer close to grip anything. The fingers will instantly open and any object in the hand will be released—an immediate disarm and the perfect tactic for using a knife defensively. 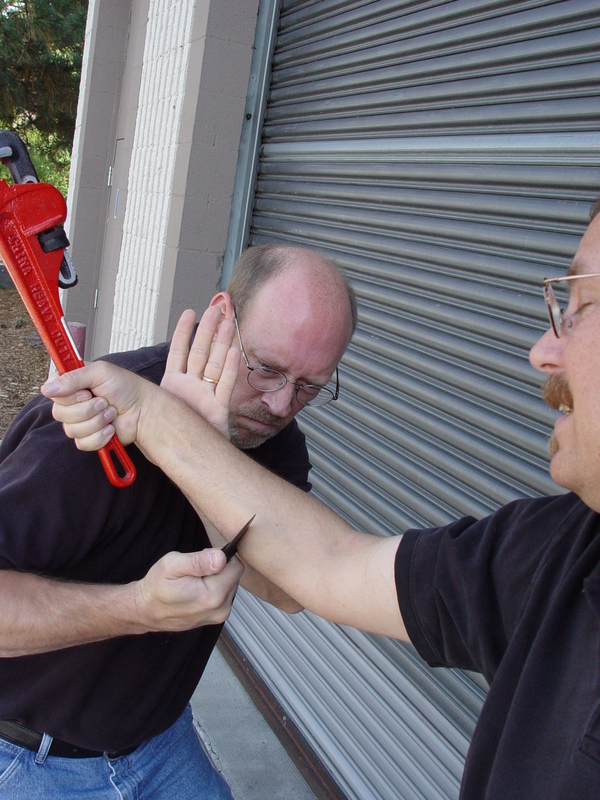 Cutting the bicep tendon/muscle of the upper arm destroys the ability to flex the arm. around the world for centuries (although I cite the Filipino arts as my inspiration for it, this tactic is also found in many other Eastern and Western systems). The disabling effects of this type of cut have also been validated in countless home and industrial accidents where people have been cut and immediately lost use of the affected limb. In fact, much of my research on the disabling effects of deep cuts to the limbs was conducted while I was doing physical therapy for a severed tendon in one of my fingers. While recovering from my own injury, I took the opportunity to ask my physical therapist about the effects of cut or severed muscles in specific parts of the body. At first, this creeped him out a bit, but once I explained the reason for my interest, he was very helpful and actually introduced me to other patients who had suffered deep, instantly disabling cuts in various types of accidents. By interviewing them, getting his expert medical insights into the type of damage caused, and comparing the depth of their wounds to the actual destructive power of a typical carry knife, I greatly refined the MBC approach to targeting. 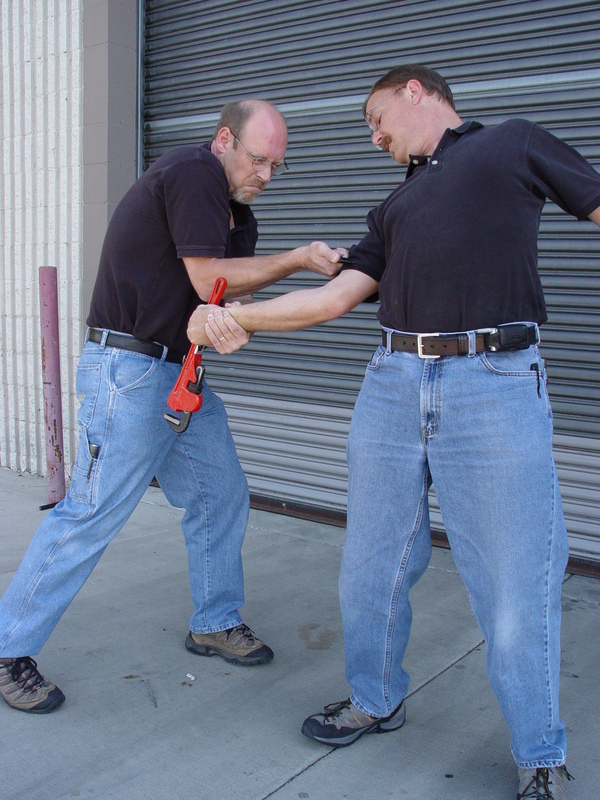 My goal was to create an easily learned system of tactics that would reliably and predictably disable an attacker in the shortest possible time when applied with a small, legal-to-carry knife. Since both clothing (like heavy winter jackets) and the dynamic nature of an attack can make it difficult to respond with complicated tactics, I also included the practice of “deconstructing” techniques—lowering the standards of application and selectively omitting steps, while still achieving the desired result. Specifically, when all else fails, minimize damage to you as best you can and attack the quadriceps muscle. Just above the knee, where the muscle narrows and connects to the patellar tendon, it is typically covered by a single layer of pants material. This area is below the bottom of most jackets and below the keys, coins, and pocket trash that could spoil the effect of your cut. Although it is a specific target, it is also a relatively large target, so if you’re close enough to reach the torso, you’re close enough to reach it. The tactic we use to target it—called a “Comma Cut”—makes this even easier. The quad cut – a large target that offers significant value as a target that limits or destroys mobility. If your attacker can’t stand, they can’t fight. to the inner thigh to penetrate the pant leg and, if desired, target the femoral nerve and artery (secondary levels of stopping power to be discussed in a future article). Once the blade is in the flesh, drop your elbow to your side so your hand turns palm up with the knife still in the wound channel. With your elbow tight to your ribs and your forearm angled downward, drop your body weight and cut forward. Done properly, the cutting edge will “bottom out” against the femur (thigh bone) and circumscribe it as it severs the quadriceps muscle just above the knee. If your aim is imperfect, the Comma Cut is designed to be self-compensating and will still get the job done. In simple terms, all you need to do is get your knife hand somewhere between your attacker’s legs to index the target leg by feel. This “fighting by Braille” approach works extremely well, even in diminished light. Once you have a proper index between his legs, just execute the technique. The thrust “finds” the target and the rotation/elbow drop becomes a powerful pressure cut to the quadriceps that still does the job exceedingly well. 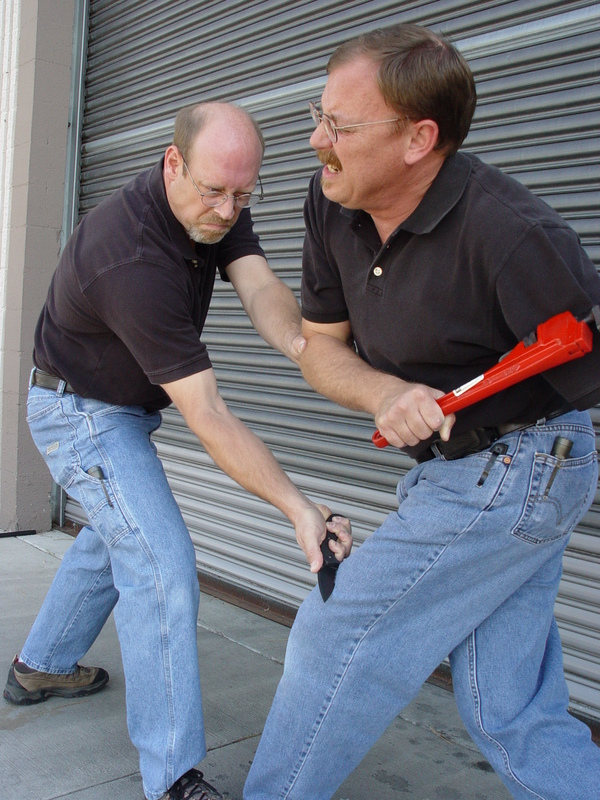 Remember to cut at a downward angle to maximize the use of your body weight for power and to “stick” the attacker’s leg to the ground so he can’t retract it and avoid the cut. Cutting the quadriceps is a “mobility kill”—a tactic that destroys your attacker’s mobility so he can no longer deliver violence to you. If you drop him in place, you decisively “stop” him and can easily create distance, escape to safety, or, if necessary, deal with other attackers. Even if your other cuts failed to have the desired effect, a well-executed mobility kill is all you need to put an decisive end to an attack and keep yourself safe. That’s why MBC regards it as the ultimate “money shot” and all the system’s tactics gravitate toward it as a finishing technique. 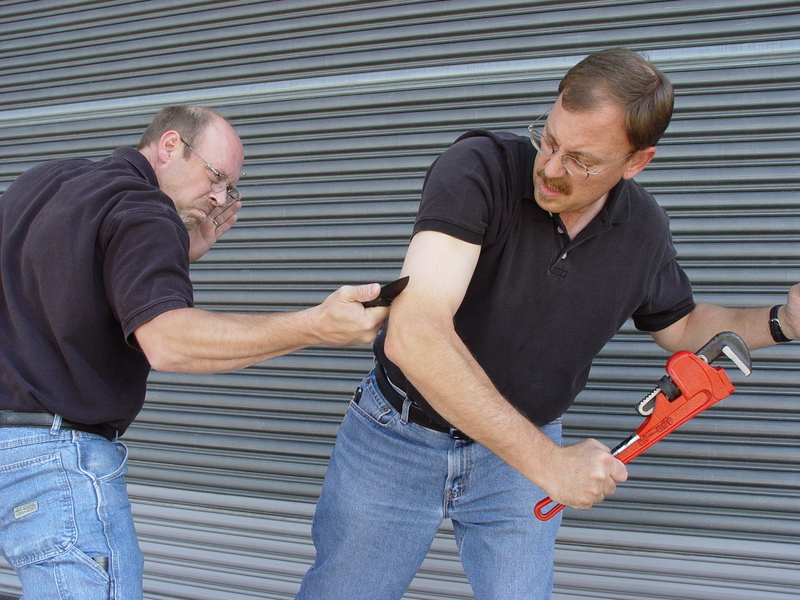 Real self-defense is all about stopping power. With a knife, that means dispelling the myths and misinformation and focusing on cutting body parts that will cripple an attacker quickly, decisively, and reliably. To learn more, please visit Mike’s website or to get books and videos on the subject, please visit the Martial Blade Concepts page. Good article. At 5 foot nothing, I hope to never get into a physical altercation with someone but Ill probably remember this tactic! Excellent article that gives straight forward easy to understand advice. Thanks. Clear, concise, and important information…Thanks for sharing! There is nothing instantaneously incapaciting about using a 3 knife delivering cuts to targets that do not systemically shut down the bad guy. That is why they do do it in prison. I wouldn’t shoot for an appendage either. Thrust to vital organs. Proven through history. ← Are You Fit? How About Fit To Fight? The Four Key Attributes That Make a Difference!